1 A None No Power Seat 1 A is a Business Class seat that offers extra legroom due to the position of the bulkhead. The proximity to the lavatory is not bothersome since the front lavatory is reserved for crew members only. 1 D None No Power Seat 1 D is a Business Class seat that offers extra legroom due to the position of the bulkhead. The proximity to the lavatory is not bothersome since the front lavatory is reserved for crew members only. 1 F None No Power Seat 1 F is a Business Class seat that offers extra legroom due to the position of the bulkhead. The proximity to the lavatory is not bothersome since the front lavatory is reserved for crew members only. 1 H None No Power Seat 1 H is a Business Class seat that offers extra legroom due to the position of the bulkhead. The proximity to the lavatory is not bothersome since the front lavatory is reserved for crew members only. 20 A None No Power Seat 20 A is a standard SAS Plus seat with extra legroom due to the Bulkhead. 20 B None No Power Seat 20 B is a standard SAS Plus seat with extra legroom due to the Bulkhead. 20 D None No Power Seat 20 D is a standard SAS Plus seat with extra legroom due to the Bulkhead. 20 E None No Power Seat 20 E is a standard SAS Plus seat with extra legroom due to the Bulkhead. 20 F None No Power Seat 20 F is a standard SAS Plus seat with extra legroom due to the Bulkhead. 20 G None No Power Seat 20 G is a standard SAS Plus seat with extra legroom due to the Bulkhead. 20 H None No Power Seat 20 H is a standard SAS Plus seat with extra legroom due to the Bulkhead. 22 A None No Power Seat 22 A is a standard SAS Plus seat. 22 H None No Power Seat 22 H is a standard SAS Plus seat. 30 A None No Power Seat 30 A is a standard Economy Class seat that has extra legroom due to the position of the bulkhead. There is no floor storage for this seat during takeoff and landing. 30 B None No Power Seat 30 B is a standard Economy Class seat that has extra legroom due to the position of the bulkhead. There is no floor storage for this seat during takeoff and landing. 30 C None No Power Seat 30 C is a standard Economy Class seat that has extra legroom due to the position of the bulkhead. There is no floor storage for this seat during takeoff and landing. 30 D None No Power Seat 30 D is a standard Economy Class seat that has extra legroom due to the position of the bulkhead. There is no floor storage for this seat during takeoff and landing. 30 E None No Power Seat 30 E is a standard Economy Class seat that has extra legroom due to the position of the bulkhead. There is no floor storage for this seat during takeoff and landing. 30 F None No Power Seat 30 F is a standard Economy Class seat that has extra legroom due to the position of the bulkhead. There is no floor storage for this seat during takeoff and landing. 30 G None No Power Seat 30 G is a standard Economy Class seat that has extra legroom due to the position of the bulkhead. There is no floor storage for this seat during takeoff and landing. 30 H None No Power Seat 30 H is a standard Economy Class seat that has extra legroom due to the position of the bulkhead. There is no floor storage for this seat during takeoff and landing. 37 A None No Power Seat 37 A is a standard Economy Class seat whose proximity to the lavatories may be bothersome. 37 B None No Power Seat 37 B is a standard Economy Class seat whose proximity to the lavatories may be bothersome. 37 G None No Power Seat 37 G is a standard Economy Class seat whose proximity to the lavatories may be bothersome. 40 A None No Power Seat 40 A is a standard Economy Class seat with extra legroom due to the Exit Row, however, the proximity to the lavatories may be bothersome. 40 B None No Power Seat 40 B is a standard Economy Class seat with extra legroom due to the Exit Row, however, the proximity to the lavatories may be bothersome. 40 G None No Power Seat 40 G is a standard Economy Class seat with extra legroom due to the Exit Row, however, the proximity to the lavatories may be bothersome. 40 H None No Power Seat 40 H is a standard Economy Class seat with extra legroom due to the Exit Row, however, the proximity to the lavatories may be bothersome. 41 C None No Power Seat 41 C is a standard Economy Class seat with extra legroom, however, the proximity to the lavatories may be bothersome. 41 D None No Power Seat 41 D is a standard Economy Class seat with extra legroom, however, the proximity to the lavatories may be bothersome. 41 E None No Power Seat 41 E is a standard Economy Class seat with extra legroom, however, the proximity to the lavatories may be bothersome. 41 F None No Power Seat 41 F is a standard Economy Class seat with extra legroom, however, the proximity to the lavatories may be bothersome. 51 D None No Power Seat 51 D is a standard Economy Class seat that may have slightly restricted legroom due to the misalignment with the row in front. The tray table is in the armrest, making the armrest immovable and slightly reducing seat width. 51 E None No Power Seat 51 E is a standard Economy Class seat that may have slightly restricted legroom due to the misalignment with the row in front. The tray table is in the armrest, making the armrest immovable and slightly reducing seat width. 51 F None No Power Seat 51 F is a standard Economy Class seat that may have slightly restricted legroom due to the misalignment with the row in front. The tray table is in the armrest, making the armrest immovable and slightly reducing seat width. 53 A None No Power Seat 53 A is a standard Economy Class seat however, legroom and floor storage may be limited due to the presence of an entertainment equipment box under the seat in front. 54 A None No Power Seat 54 A is a standard Economy Class seat that may feel cramped and narrower due to the curvature of the plane. The proximity to the lavatory and galleys may be bothersome. 54 B None No Power Seat 54 B is a standard Economy Class seat that may feel cramped and narrower due to the curvature of the plane. The proximity to the lavatory and galleys may be bothersome. 55 A None No Power Seat 55 A is a standard Economy Class seat in the last row of the aircraft that may have limited recline. The proximity to the lavatory and galleys may be bothersome. 55 B None No Power Seat 55 B is a standard Economy Class seat in the last row of the aircraft that may have limited recline. The proximity to the lavatory and galleys may be bothersome. 55 D None No Power Seat 55 D is a standard Economy Class seat in the last row of the aircraft that may have limited recline. The proximity to the lavatory and galleys may be bothersome. 55 E None No Power Seat 55 E is a standard Economy Class seat in the last row of the aircraft that may have limited recline. The proximity to the lavatory and galleys may be bothersome. 55 F None No Power Seat 55 F is a standard Economy Class seat in the last row of the aircraft that may have limited recline. The proximity to the lavatory and galleys may be bothersome. 55 G None No Power Seat 55 G is a standard Economy Class seat in the last row of the aircraft that may have limited recline. The proximity to the lavatory and galleys may be bothersome. 55 H None No Power Seat 55 H is a standard Economy Class seat in the last row of the aircraft that may have limited recline. The proximity to the lavatory and galleys may be bothersome. 8 A None No Power Seat 8 A is a standard Business Class seat whose proximity to the lavatories and galley may be bothersome. 8 F None No Power Seat 8 F is a standard Business Class seat whose proximity to the lavatories and galley may be bothersome. 8 H None No Power Seat 8 H is a standard Business Class seat whose proximity to the lavatories and galley may be bothersome. 9 A None No Power Seat 9 A is a standard Business Class seat that has extra legroom however, the proximity to the lavatories and galley may be bothersome. 9 D None No Power Seat 9 D is a standard Business Class seat that has extra legroom however, the proximity to the lavatories and galley may be bothersome. 9 F None No Power Seat 9 F is a standard Business Class seat that has extra legroom however, the proximity to the lavatories and galley may be bothersome. 9 H None No Power Seat 9 H is a standard Business Class seat that has extra legroom however, the proximity to the lavatories and galley may be bothersome. All classes of service feature Audio and Video on Demand. All classes feature in-seat LCD Personal TVs with Audio and Video on Demand. SAS offers all passengers complimentary headphones, in all classes. Passengers flying in the Business Class can enjoy the entertainment programs on a 15.4'' LCD screen while passengers traveling in SAS Plus and Economy Class have a smaller LCD screens, at 12" and 9", respectively. For more information regarding the entertainment programs, read SAS Entertainment Catalogue. All classes of service feature in-seat regular AC Power, available at every seat. Complimentary Wi-Fi is available for all passengers in Business and SAS Plus, Wi-Fi is available in Economy however, rates may vary. Passengers can pay with credit card and cash in the following currencies: DKK, NOK, SEK, EUR, USD and GBP. Passengers can also pay with EuroBonus points. SAS operates the A340-300 on medium to long-haul flights, mostly intercontinental flights. This aircraft has a three classes configuration and it flies with 40 Business Class seats, 28 SAS Plus seats, and 179 Economy Class seats. The Business Class seats have an additional 3 inches when lying flat, converting from 20'' in seating mode to 23'' in sleep mode. 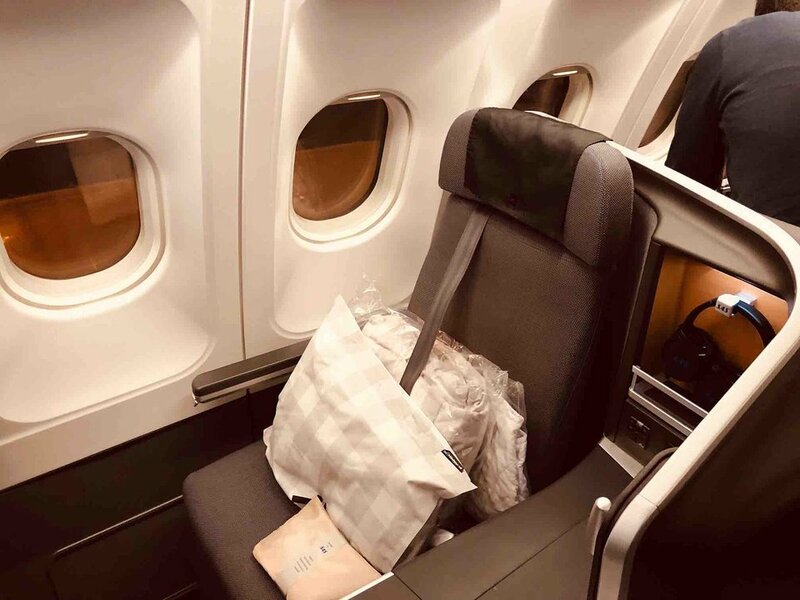 SAS has revamped its domestic and European service classes, replacing the Economy, Economy Extra and Business with two new products: SAS Go and SAS Plus. The new services came into effect on June 2013. Passengers traveling with the SAS Go services receive the following benefits: tickets can be changed for a fee, 24-hours money-back guarantee, 1 piece of baggage up to 50 lb/23 kg per person, child discount, internet check-in by SAS app, SMS or at the airport, mobile boarding pass, choose your seat free of charge up to 22 hours before departure at check-in, newspaper, coffee and tea included, free breakfast before 9am on Nordic domestic flights, food and drinks on board for purchase. Passengers travelling with the SAS Plus service receive additional benefits including: tickets can be changed and refunded for free, 24-hour money-back guarantee, 2 pieces of baggages up to 50 lb/23 kg per person, child discount, internet check-in by SAS app, SMS or at the airport, mobile boarding pass, choose your seat free of charge (front of aircraft), newspaper, coffee and tea included, breakfast always included, food and drinks onboard included, 200% EuroBonus points, access to lounges, access to Fast Track where available. SAS has teamed up with Google Street View to provide a first hand experience of their new cabin. For a virtual walkthrough, visit SAS's site. I believed in the comment in here and was happy to get the 20B, but as mentioned by another commenter already the whole row 20 has definetly less leg room than the other SAS Plus seats because of the wall as seperation to the business class, luckily the flight was not that full so I could change to21F where I could put my legs completely straigt under 20F (1.82 m), this would be never possible in row 20. These seats are ok. There's no additional privacy being upfront and I was blinded by a light in the closet in front of 1A that flight attendants kept opening through the whole flight. The seat felt thin but it is wide. I've slept better on other style seats. TV screen was crisp and filled with movies. Service was friendly but it took 2.5 hours to finish dinner. There were at least 3 attendants in business but they would disappear for 30 minutes or more between drinks or food. Food was ok at best and not filling. Breakfast was solid, though rushed. Row 20 (in PLUS) has several bassinets. If a request for a passenger with an infant comes in, pax seated there without an infant will be re-allocated to another seat! SAS never informs re-seated passengers in such cases. Beware! Row 20 in SAS Plus have smaller LCD displays. Wonderful seat, plenty of leg room and a comfortable 11h flight from PVG to CPH. The only disadvantage is the width, it is quite limited. I flew SK943 CPH-ORD and was disappointed when I found out that I was not flying in the new SAS Business class. There is a configuration of aircraft that is not represented here nor on the SAS website. It is their backup aircraft used often (LN-RKP). The aircraft has old LAN Chile business class seats, that are angle lie-flat, the entertainment is different, and the aircraft does not have Wi-Fi. 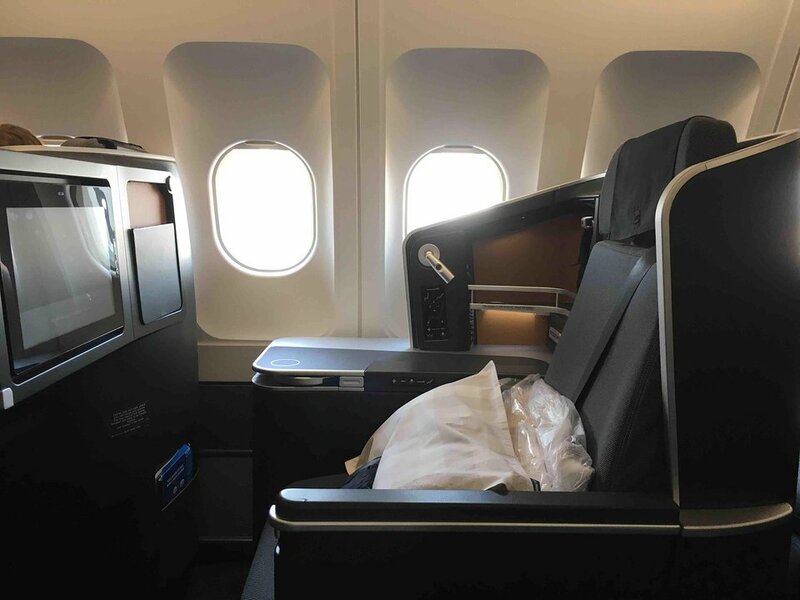 The business class cabin is 2-2-2-2 and is not quite as nice of an experience as the new SAS cabins. The cabin is very old and worn. Seat 1D in SAS Business Class is a great seat, it is a fully flat seat. The service was great! Seat 9H, Flight SK935 CPH-SFO, Oct 2017. Overall good experience, proximity to lavatories/galley (not directly adjacent to seat  storage space in between) was no problem for me at all (but I am also not noise-sensitive when I sleep. ;-), very comfortable seats that reclines to complete flatness, massage function in seat (havent tried/used), sufficient leg space for 6 ft. person, easily accessible separate compartment e.g. for shoes/blankets during flight, power outlet (compatible with multiple connector types), 2*USB outlet (havent tried/used), nice big entertainment screen, big movie selection but not too many movie highlights, decent remote control for entertainment system (lacking e.g. a dedicated pause button), decent noise cancelation earphones, WiFi throughout almost entire flight  but need crew support to connect ... nothing really to complain about. Seat 8F, Flight SK936 SFO-CPH, Oct 2017. Overall good experience, proximity to lavatories/galley (not directly adjacent to seat  storage space in between) was no problem for me at all (but I am also not noise-sensitive when I sleep. ;-), very comfortable seats that reclines to complete flatness, massage function in seat (havent tried/used), sufficient leg space for 6 ft. person, easily accessible separate compartment e.g. for shoes/blankets during flight, power outlet (compatible with multiple connector types), 2*USB outlet (havent tried/used), nice big entertainment screen, big movie selection but not too many movie highlights, decent remote control for entertainment system (lacking e.g. a dedicated pause button), decent noise cancelation earphones, WiFi throughout almost entire flight  but need crew support to connect ... nothing really to complain about. I would say that row 20 has less legroom due to the proximity of the wall and inability to stick you feet under the seat in front of you as on other rows. Also the LCD screen is noticeably smaller on row 20 than on the other SAS Plus seats as it folds up from the arm rest. All-in-all, I would rate row 20 below the other Plus rows (rows 21-23). While i agree on the points associated for various other airlines operating A340s, it's not really the case with SAS' A340s. I've sat in the last seat on their route from CPH-SFO and back again a week later. Mainly, the "seats might feel cramped" part on 55 and 54 are NOT true, it's actually the opposite - the airplane is only ever so slightly narrower, but only 3 seats are located to the right - one less than there is up front. The seats on 54 and 55 are noticably wider, and do NOT have limited recline. The recline seems like more than what would be acceptable than if you had someone behind you at all. The only disadvantage is you will be served food and drinks last, so it takes a little while to get there, but it does. In my 2 times i've been in this seat (a few months ago, in April), rows 54-55 should be marked green. I'd happily choose these seats over any other economy seat in the SAS A340 again. I had seats 37G&H from San Francisco to Copenhagen. I had absolutely no issues with the restrooms proximity. There was no noise and I never experienced an issue with people hanging around. I was supposed to have these same seats on the way back but due to an airplane change we had a different seat configuration so I wound up with middle row seats. I much preferred the row 37G&H seats to the row 32E&F I had on the way home. The upgraded cabin has been very successful and is now one of the nicest if not the nicest on the market. Very comfortable and well functional flat seat and good quality entertainment modul. Food was very good too. I will easily choose this option next time too. They had wifi on the plan, but unfortunately I couldn't make it work. After upgrading the interior, the SAS Business Class is second to none. Flatbed, easy access to the aisle for all passengers, good privacy, excellent audio/video systems and even the food seems upgraded compared to previous flights on SAS. Now they only have to fix a better wine list to become really outstanding. Not very comfortable. Old fashioned. No USB for a phone. The remote for entertainment is in the armrest. Not efficient and difficult using earphone if you want the armrest upwards. We choose this seat 24h before our flight departure time, so it is free. The row space is a bit larger, which is good since we have an infant. It is relatively quite compared with the seat in the back area. 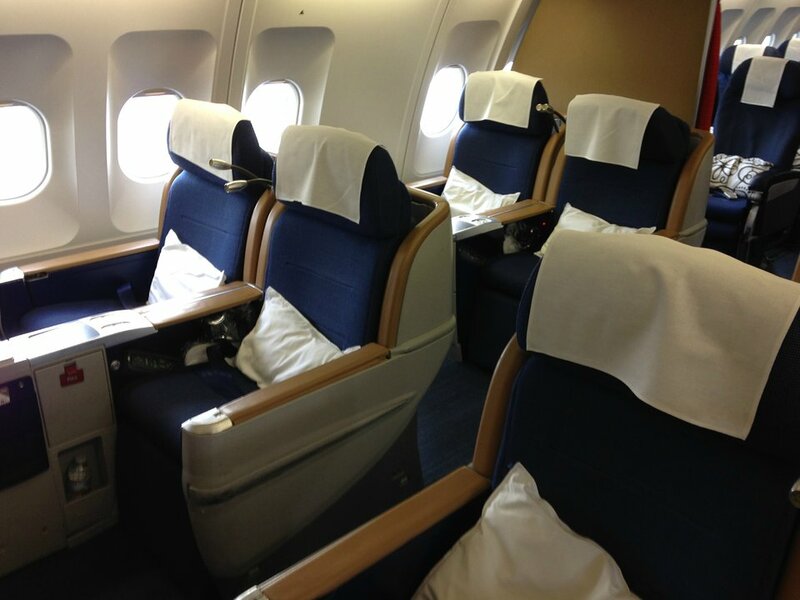 The business class in SAS has now been updated. Seats are of same type as e.g. Austrian. This is in my opinion one of the best BC seats right now in the common carriers. Very wide, comfortable and long. The only "problem" is that you may unintentionally move the seat due to very sensitive touch pad - but this is a complaint on high level. Entertainment system is absolute up to date, enormous selection of movies, music etc. Easy to operate. SAS did on this flight not provide sound dampening earphones, this is still to be improved. Service at SAS is as usual. OK, but not superb, quality of food is agreeable (but there is better in other business class carriers of Western Europe). This is a good seat with the extra wide aisle. You can stretch your legs out in to it without obstructing. Row 20A+B and 21A+B and the row in from are extremely noisy due to a hydraulic pump that goes on for 6-7 hours during flight. Avoid these seats for all costs! You ay even damage your hearing! New cabin is great taking SAS from bottom to top. I especially like the privacy and storage. Only complaint on this trip from Pudong to CPH was that I couldn't get the wifi to work, not so important as I didn't ask for help, but anyhow. Food and wine service is very good. Leg room is better than i expected. Seatback reclines more than some other airlines. The little seat space is additionally limited by the black box under the front seat, so you've got only half of the leg space to somehow stick your legs. Crapy pehistoric "entertainment" system, which shows movies only in loop, so you have to wait for wathing it from the beginning and cannot stop or rewind it. So taking your own laptop or ipad might be a better option. This seat has less legroom than other standard economy seats. I could not fit in this seat at all, and therefor changed to the F seat where I could stretch without problems. I'm almost 2m tall. Wanted to change from seat 31H from Oslo to Shanghai after checking SeatGuru. After 102 minutes of waiting for SAS Telephone service I was informed that the whole row 23 recommended by SeatGuru now are "Restricted Sseats", and cannot be reserved. 42H offers standard legroom with full recline and a bit privacy. Behind the seat is wall and crew area, there are no seat back kickers and you still have space if person front of you reclines. Curvature of the fuselage does not make this seat cramped, there is actually more space as aisle is wider and as three seat abreast in the middle starts from his same row. Only minus is that you will feel the movements of the aircraft more easily as this is one of the last row seats, but best of them. The crew uses the area in front of row 1. Everytime they entered or exited the area, the curtain would bump my legs. Very annoying. Furthermore, the recline was unnatural and not flat. 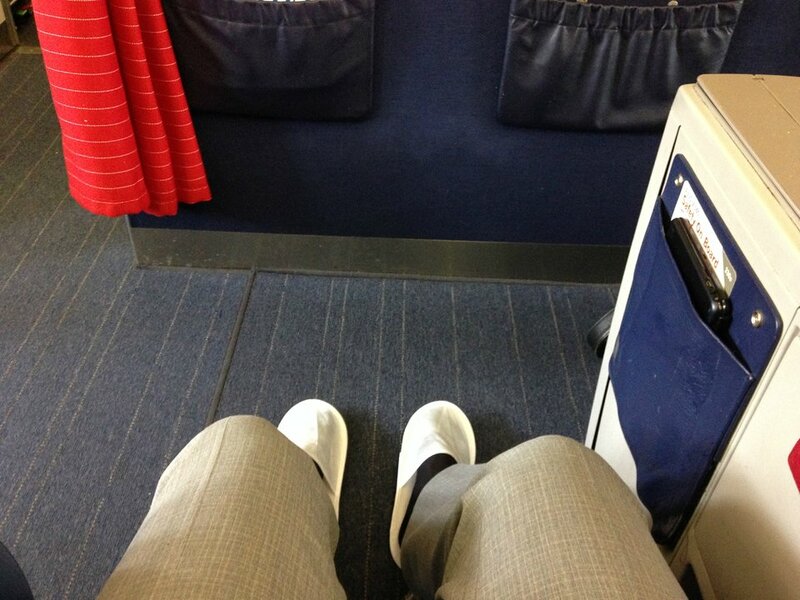 I am 6'1" tall and I always have trouble with business class seats not having a long enough extension for the leg and foot rest. However, most of these types of seats (United, Lufthansa) have a foot rest than can be flipped up so at least you don't have the pain of hanging your ankles over the end of the leg rest. The SAS business seat also has this flip up foot rest but its profile is curved and only goes up about 2 inches. Consequently, you can't get any part of your foot to rest on it and it digs into your Achilles tendon. The restriction of legroom is severe and base of seat is at odd angle. Rough 8 hours of flight. seats are difficult to sleep in, feet are much lower than the rest of the body and the contour of the seat is not natural. The seat controls are difficult to understand and they all did not do what the diagrams indicated. 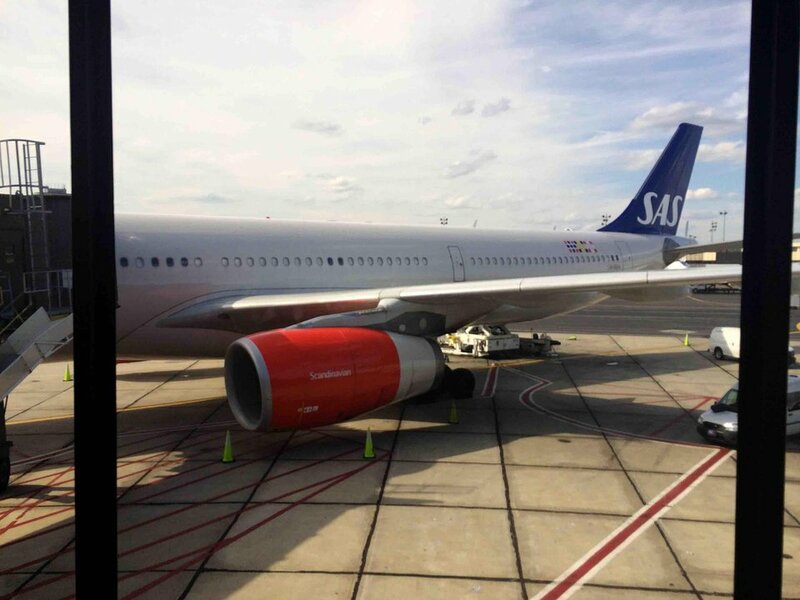 SAS flies 1 versions of Airbus A340-300 .